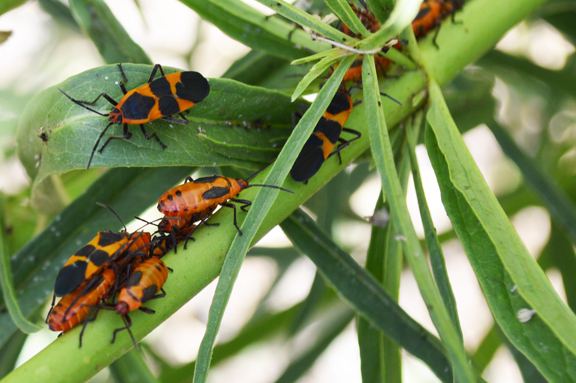 Above: milkweed beetles in the insectary at the Groth winery in Oakville (Napa). 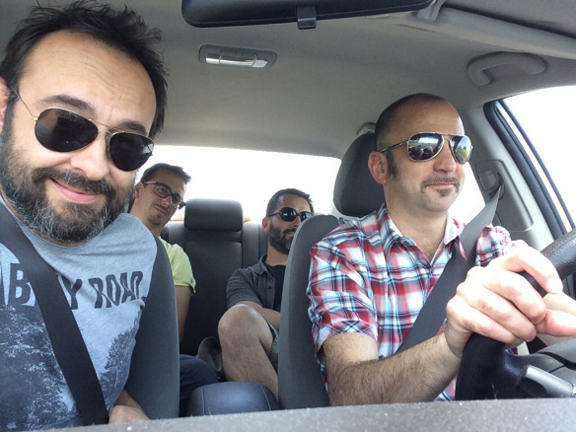 As I led my bromance Giovanni Arcari and team sparkling wine on a tour of California wine country, we had visited the radical and the insider. And now it was time to visit one of California’s great legacy estates. Why Groth? 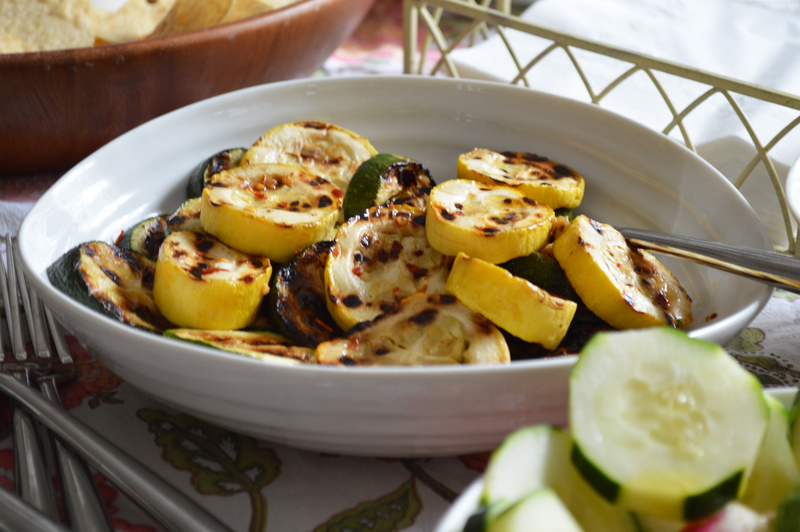 Because our friend and favorite Napa-based wine blogger, Joanne Farrell aka VinoGirl, author of Vinsanity, works there. 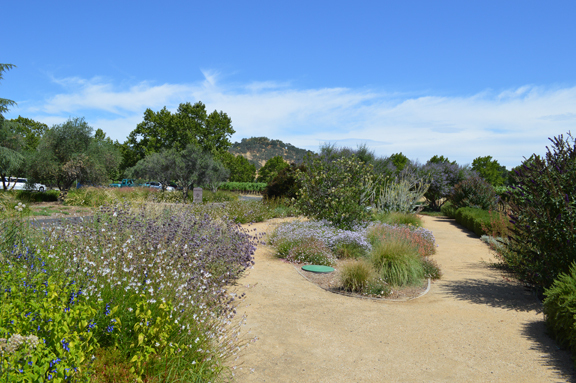 Above: the winery’s insectary lies adjacent to the estate’s top vineyards. 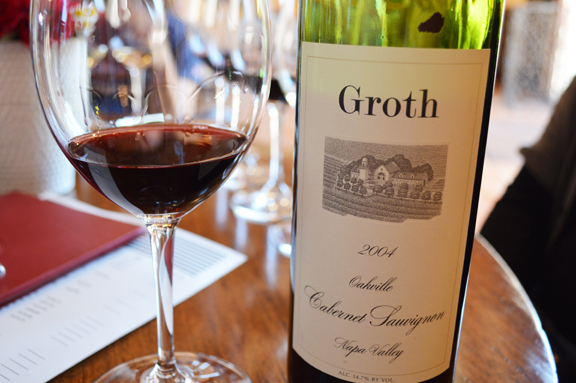 As VinoGirl, one of the tasting room docents, led us on our tour, she told us that Groth was the first wine for which Robert Parker, Jr. awarded the elusive 100-point score, thus making Groth the Nadia Comăneci of Napa, as it were. 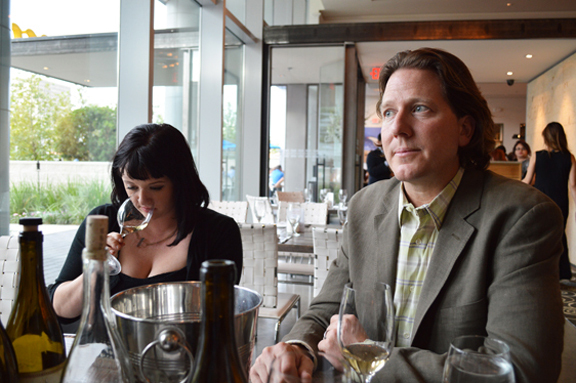 There is a tendency in the indy wine community to be distrustful and even disdainful of wines like Groth. And this is due in part to the way that the wine establishment (viz., Parker et alia) has embraced the wines. Many among us assume that these wines are highly manipulated in the cellar and we often conjure images of lab-coat-donned technicians tinkering away, crafting gold-scoring wines like alchemists. Above: the Spanish-colonial-inspired architecture at Groth evokes power and opulence. But as VinoGirl led us outside to walk through the winery’s top growing site, we learned that the winemaker’s focus is in the vineyard, where organic and conventional growing practices are applied in harmony. VinoGirl holds a degree in viticulture from Napa Valley College and I was humbled as she and team sparkling wine compared notes on the finer points of grape growing. Above: there is no official “reserve” designation in Napa, VinoGirl explained. But the term is often used to denote a winery’s flagship wine like the Groth Oakville Reserve. When we sat down in the lovely tasting room, I was impressed, once again, by the caliber of the tasting room guides and their superb hospitality and congeniality. They seemed to make everyone, including us, feel like a rockstar. VinoGirl was keen to pour us the 2004 Groth Oakville Reserve. And I have to say: I found the wine to be balanced and delicious. Its wood was well integrated and its red fruit evolved. Even the hypercritical Italians liked it and they were not an easy crowd to please by any means. Above, from left: Giovanni, me, Nico, and Andrea in the Groth insectary. Photo by VinoGirl. I must be honest: Groth isn’t exactly my speed in wine. The wines don’t align seamlessly with my personal taste. But I was excited to learn more about this supreme expression of Napa and to share it with my fellow travelers. In the wake of this experience, there’s no doubt in my mind that Napa is peerless when it comes to wine tourism. We were there as friends of VinoGirl, of course. But our tour, including the excellent presentation, was the same as that of other guests (including the jolly middle-aged lady who wished the Italians buon natale from across the room). 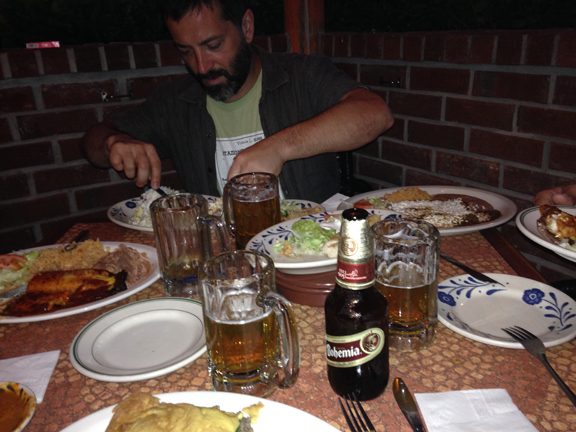 After the tour, VinoGirl led us to the Norman Rose Tavern in downtown Napa for beers, burgers, and fried pickles. When we ordered, Giovanni asked me to get him a burger and to choose the type of cheese. The burger arrived and when Giovanni took a bite and realized that I had ordered him blue cheese, he expressed his disappointment. 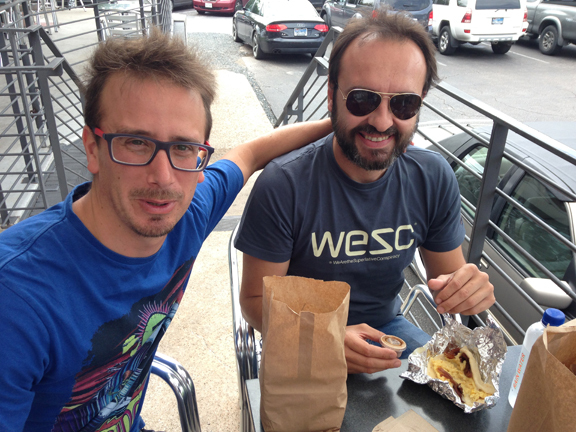 Bromance, I learned, isn’t always easy. Thank you again, VinoGirl, for a wonderful tour of the winery-where-you-are-gainfully-employed and the delightful afternoon in your town. Today, I’m taking a break from posting about last week’s California trip to share notes from my tasting yesterday in Houston with rockstar winemaker Pax Mahle from California (above, right). The whole town was buzzing — literally and figuratively — with his visit. I’ve posted this morning about my audience with him for the Houston Press. It’s a whole new California and Pax is on the cutting-edge. Thanks for reading and buon weekend yall! 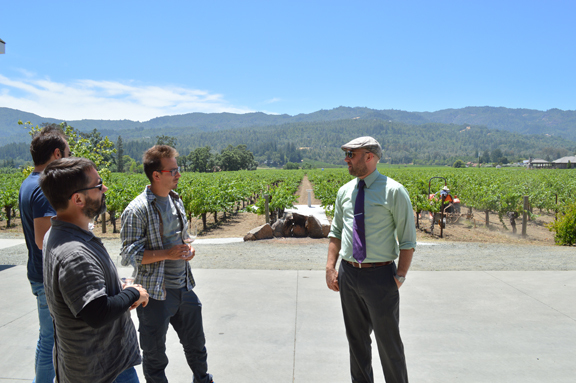 Above: I was blown away by the superb presentation and tour of the winery by Corison Wine Club Manager Galen Becker Drace (right). As much as I regret it, I have to confess that I had never attended a tasting/tour at any of the Napa marquee wineries. Yes, of course, while a student at UCLA, I had traveled to Napa and Sonoma with friends to taste. But that was long before my interest in wine had blossomed. And the wineries I visited were the usual suspects, for the most part forgettable (even for a wine neophyte). 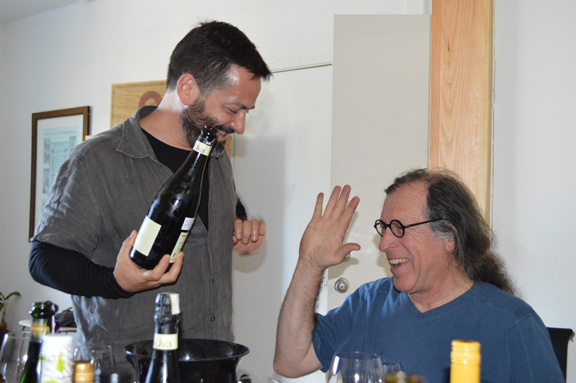 So when it came time to set up an appointment for my tour last week with Giovanni Arcari and team sparkling wine, I reached out to Hawk Wakawaka, a favorite writer and friend who lives in Sonoma and follows California wine closely (in case you missed it, btw, yesterday she published a much-talked-about interview with Robert Parker, Jr.). 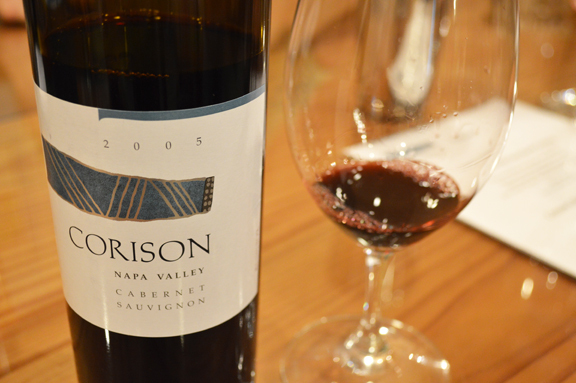 Above: the 2005 Corison Cabernet Sauvignon was a stand-out for me. Still in its youth, the wine was already beginning to show its depth and nuance. 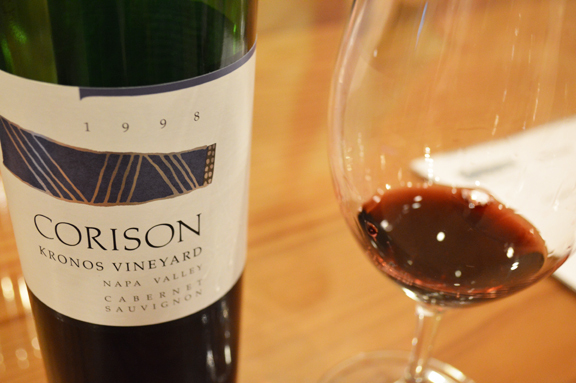 When she suggested that she help me set up a tasting at Corison, I was thrilled: I first began following the wines in the early 2000s after reading about them on Alice Feiring’s and Eric Asimov’s blogs. And I had actually tasted a lot of older vintages. Back the heyday of my French band Nous Non Plus, we used to rehearse around the corner from Keens, my favorite NYC steakhouse, where a vertical of Corison stretching back to the early 90s had been cellared unnoticed. Evidently, the prices hadn’t been augmented since acquisition and the bottles lay in affordable reach of me and my bandmates. I had always been impressed by their balance and elegance. Above: how not to be impressed by the 1998 Kronos, the winery’s flagship label? This wine was vibrant and delicious, with notes of earth and ripe and dried red fruit. The 2005 Cabernet Sauvignon remained my favorite but this wine was also exquisite. But the thing I wasn’t expecting was the superb winery presentation and guided tasting by the estate’s Wine Club Manager, Galen Becker Drace (above). 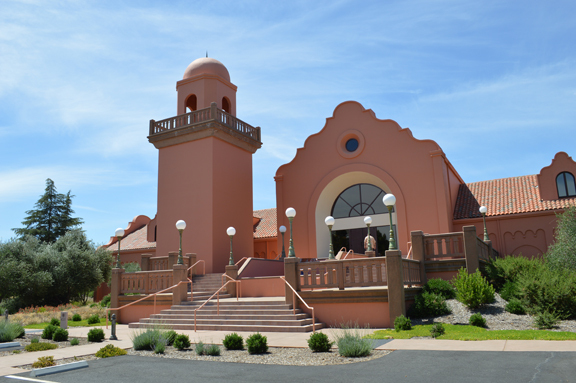 In the course of my career in wine, I’ve visited myriad wineries and tasting rooms. But I had never had the “Napa” experience. Between the hushed tones and muted oos and aas of top clients who were tasting in the barriquerie, the talented Galen led us on one of the best tours I’ve ever attended. And his wine knowledge was rivaled only by his intimate relationship with each of the wines. 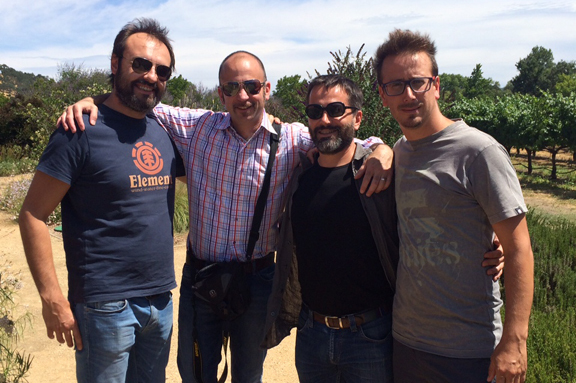 And when it came to explaining the wine club concept to my Italian counterparts, I could see their minds churning. Outside of California, there’s really nothing like the Napa experience, where you are greeted by young, bright, enthusiastic wine professionals who find true joy in sharing the wines with you. We tasted many other wines during our tour. But for a first kiss, this sure wasn’t bad. Please stay tuned for more California dispatches and thanks again, Hawk Wakawaka, for setting this up! A few months ago, when Giovanni Arcari and team sparkling wine asked me to lead them on a tour of California winemaking, my first email was to Randall Grahm (above), the pioneering winemaker who has reshaped the viticultural landscape there throughout this century and the last. And so we headed from Los Angeles last Thursday to Santa Cruz where the tidy Bonny Doon offices and winemaking facility are sandwiched quietly between a brewery and a handful of winery tasting rooms (you can see some of Giovanni’s images from our drive here). 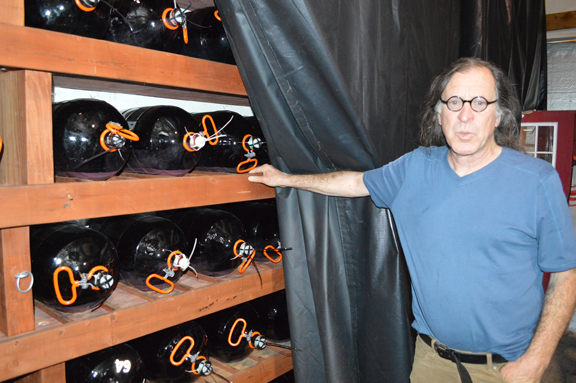 I knew that Randall was Italophile in his winemaking and that in the last few decades his interest has shifted toward Italian grape varieties. But I had no idea that he’s also Italophone: he conversed with my sparkling companions in their native tongue, just like grape grower and winemaker Thomas Jefferson, who famously spoke to Tuscan sailors in the language of Dante thanks to his knowledge of the Comedy. Before we sat down to taste a selection of his wines, he showed us the demijohns he’s using to age some of his wines (in the photo above). He stirs their lees, he explained, with an inert, teflon-lined metal ribbon that resides in the demijohn. The cellar workers run a magnet along the side of the vessel, thus guiding the ribbon through the wine and stirring the lees. 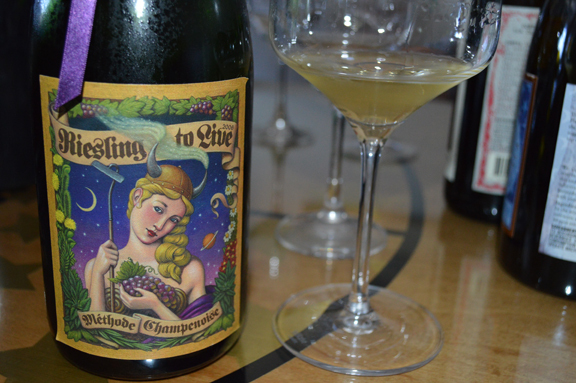 It was only natural that Randall would open the flight with one of his méthode champenoise wines, the 2006 “Riesling to Live” made with grapes from the Ca’ del Solo vineyard in Monterey (which Randall subsequently sold). This wine made such an impression in my memory that I can still taste it as I write this: zinging acidity and bright white and citrus notes with a salty lemon finish. Now in its eighth year, this wine is full of life. 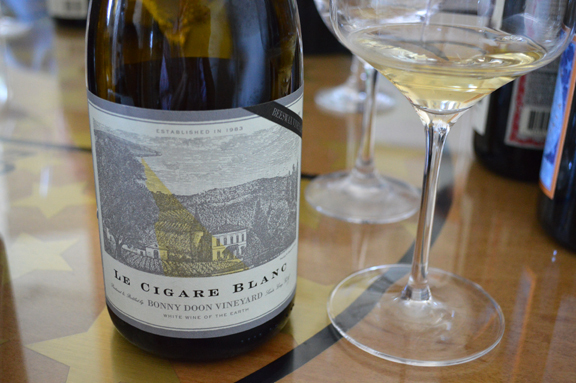 The 2011 Cigare Volant white was another favorite of mine in the flight. Rarely do you taste California white wines with this depth and character. The stone and dried-fruit notes were enhanced by an “unbearably light” mouthfeel and a graceful unctuousness that really turned me on. Randall said you should be able to find this wine for around $25. Can you name a better value in Californian wine today? There were many other standouts in the roughly sixteen wines that we tasted together (including the 2007 Ca’ del Solo Nebbiolo, which was without a doubt the best Nebbiolo I’ve ever tasted from California, truly delicious and satisfying; also the 2009 Cigar Volant red reserve aged in demijohn, so rich and so alive in its flavor, a wine that I pined to drink with dinner that night). And of course, it was remarkable to see so many of Randall’s bottles lined up side-by-side and contemplate their wonderful labels and their idiosyncrasies. But most compelling was Randall’s discourse on creating a vino di territorio, a vin de terroir, in California, where the youth of viticulture often casts the grape grower in Limbo. As he explained his efforts in crossing grape varieties in the same vineyard as one of the means to create a truly unique bioscape, I couldn’t help to think of him as a Virgil, planting the semina vertatis of a terroir in fieri. Still catching my breath after a whirlwind trip to Santa Cruz, Napa, and Sonoma to talk to some favorite winemakers there. The Italian crew and I tasted some great wines, including many that surprised us and reshaped our perception of California winemaking. I’ll be posting my “Napa dispatch” this week on the blog. 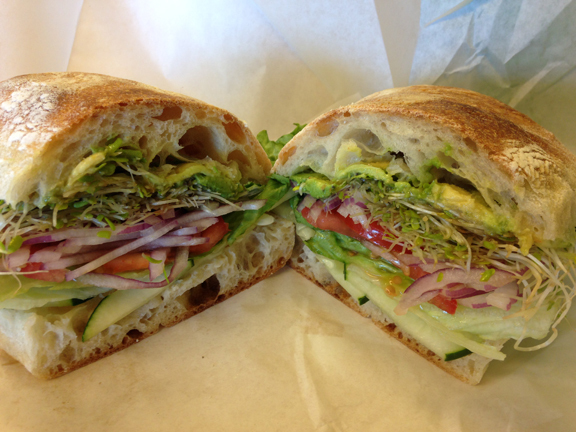 But in the meantime, as I get my feet back on the ground, I just wanted to share the best thing I ate in Napa: a [California] Veggie Sandwich at the Yountville Deli (above). It’s was everything a [California] Veggie Sandwich should be (I write California in brackets because back in my native California, they just call it a “Veggie Sandwich”). It was served on ciabatta from Bouchon bakery (delicious) and note the mandatory sprouts. 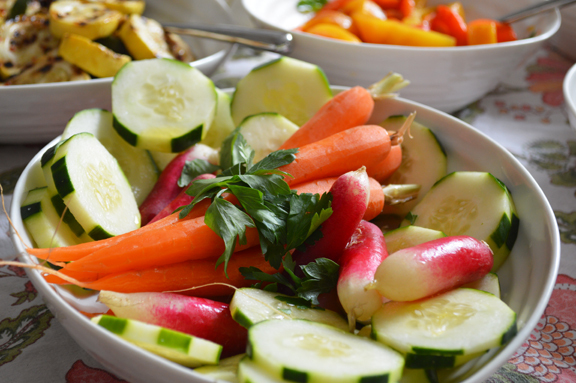 Of all the good things to eat there (and there are countless restaurants, from refined to homey, where the food is phenomenal), this is the one thing I’m still thinking about: it’s one of those simple pleasures of life that’s so satisfying and so easy to find in my home state. 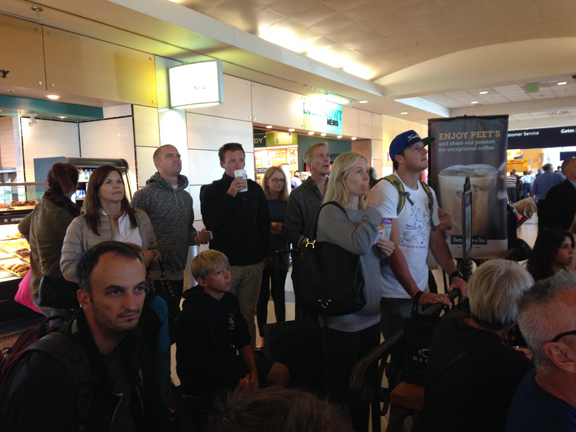 And wow, as we sat at the bar at the Oakland airport yesterday (below), it was amazing to see travelers cheer the U.S. on in the World Cup. Soccer started early for kids growing up in Southern California like me. But I don’t ever remember seeing so much interest and passion for the game. 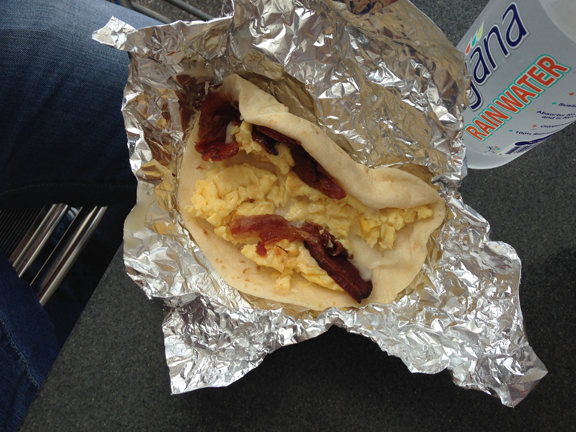 Yesterday, I took “team sparkling wine” for classic Texas breakfast tacos at Taco Deli in Austin. After all, no trip to the Groover’s Paradise is complete without them. I’m posting in hurry this morning as I head out the door to the airport to jump on a flight for Los Angeles (I’ll be at Sotto tonight, btw, pouring and talking about wine). 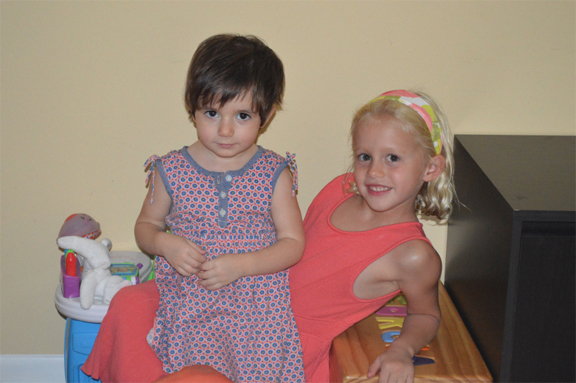 Somewhere between changing a diaper and kissing a booboo this morning, I did manage to translate this post for my client Bele Casel. It’s about the absurdity of the Prosecco consortium’s restrictions on sales. I’m always impressed by grape grower Luca Ferraro’s earnestness in writing about his appellation and his wines. And I highly recommend the post to you: I believe that Luca’s insights can help us to understand how Prosecco is changing. “I’m just a simple farmer,” he writes. “But I would have preferred lower maximum yields over the current policy” of blocking sales. 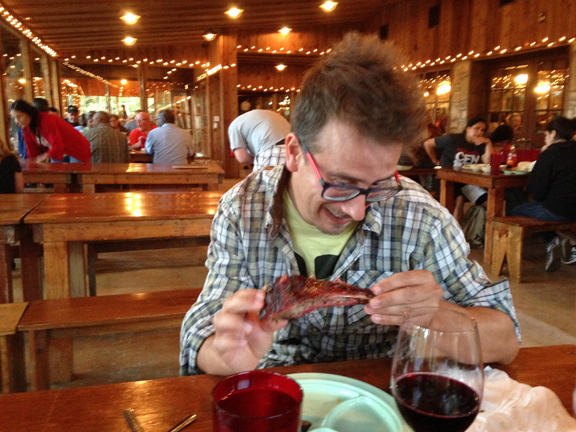 Lastly, Houstonians, if it’s not on your radar, Tony will be pouring Massolino 2009 Barolo next Tuesday at Ciao Bello for his “Evening in Piedmont” dinner. I’ll be there to talk about the wines. Thanks for reading and I’ll see you on the other side! 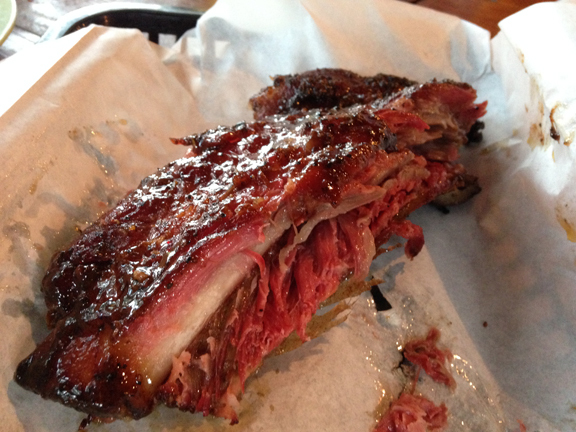 Tender, fall-off-the-bone beef ribs were the star of the show last night at the Salt Lick in picturesque Driftwood in the heart of the Texas Hill Country. They’re not the only ones in the world to be working with frozen grape must as a means to make sparkling wine. But they are the first to do it in Franciacorta. Andrea Rudelli, Domenico “Nico” Danesi, and Giovanni Arcari (my bromance) call it Solo Uva (just grapes): they freeze and reserve some of the grape must after pressing and then they use it as the sugar in both the tirage (i.e., the addition of sugar and yeast to the base wine in order to provoke the second fermentation) and the dosage (i.e., the addition of sugar before bottling to achieve the desired balance of acidity and sweetness). The resulting wines have no cane sugar added to them (the traditional practice for classic method and Champagne method wines). But the thing that really sets the wine apart as a new category of classic method Franciacorta is the fact that they allow the grapes to achieve full phenolic ripeness before harvesting. Where some sparkling winemakers pick early in order to obtain higher acidity (notably in Champagne and also in Franciacorta), this trio of winemakers lets the grapes ripen fully. As a result, the wines have a markedly rich (and arguably richer) fruit profile and a more vinous quality. 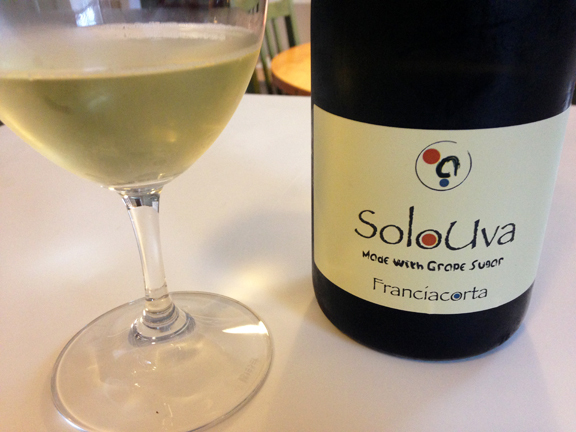 It’s a new and perhaps revolutionary approach to Franciacorta and sparkling wine. And one of the coolest things about what they’re doing is that they have shared their technique openly with their peers and colleagues at home. They believe that this new method represents the future for their appellation and they liberally reveal the process to anyone who’s interested to find out more. At Vinitaly in April, I tasted another Franciacorta made using this method (by Vezzoli) and a Barbera rosé (by Barolo producer Principiano). Both were wonderful. Because they don’t adjust for sweetness using an extraneous sweetener, the wines have unusual depth and character. Not better, but different from conventional classic and Champagne method wines. I’ve found the wines to be truly compelling. Tracie P and I thoroughly enjoyed a bottle of Solo Uva on Saturday night in anticipation of the trio’s arrival in Texas (that’s them above, from left, Andrea, Nico, and Giovanni). 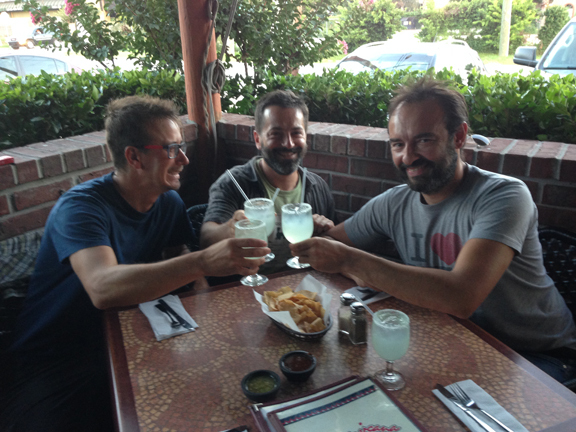 They landed last night at Bush and I took them directly for margaritas and Tex Mex at one of our favorite Houston restaurants, La Mexicana. Today, I’m taking them to see some Texas sights and hear some Texas music before we head to California for a short business trip in wine country and a stop in LA at Sotto on Thursday night. I’ll be posting on our adventures as time permits. Stay tuned! 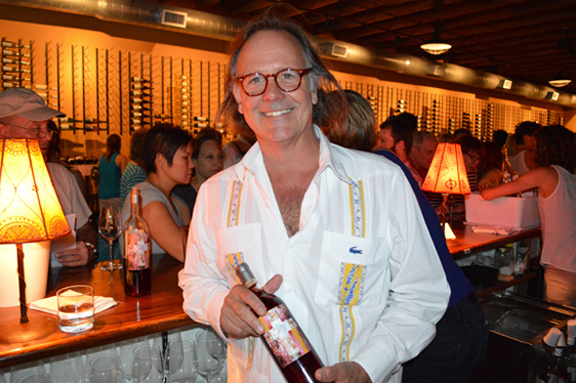 Above: grape grower and winemaker Lewis Dickson is one of just a handful of Texas winemakers who produce wines using Texas-grown fruit exclusively. Last week, the Texas Department of Agriculture released proposed changes in how its “Go Texan” licensing will be regulated. Currently, Texas bottlers can print the “Go Texan” logo on their labels even if the wine in the bottle is not made from Texas-grown grapes. Yes, even a bottle that contains no Texan grapes whatsoever can sport the logo. If approved, the proposed changes would require that at least 75 percent of the fruit must be from Texas. But the proposal doesn’t address the fact that up to 80-90 percent of wine sold as “Texan” is actually sourced from out-of-state growers. Much of it is vinified beyond the Texas border and is simply bottled here. Today, the Houston Press published my editorial on deceptive marketing practices in the Texas wine industry. Here’s the link. Thanks for reading. 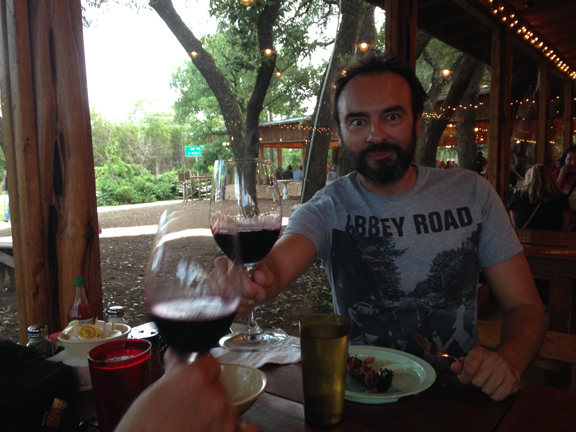 And here’s a link to Alfonso’s post on the Duchman Vermentino, a Texan-grown wine that caused a ruckus at the California State Fair wine competition last week.